1/18/2016Share this story on Facebook! Ithaca's base in London is an elegant restored Victorian house in the heart of the Royal Borough of Kensington and Chelsea. The London Center is an ideal jumping-off point for exploring London. Learn more about the London Center. While still in elementary school in Thailand, Ravi “Riw” Rakkulchon ’15 read a novel entirely in English for the first time. The book was Little Women by Louisa May Alcott. Several years later, during his senior year at Ithaca College, Rakkulchon became the set designer for the opera adaptation of that book. Rakkulchon, an international student from Bangkok, discovered his love of theatrical design during his junior year of high school, while making costumes and masks for school productions. The more he became involved in school productions, the more he began to see theatre’s effect. “People respond to things visually, which is why I decided to study theatre design,” he said. According to Rakkulchon, theatre in Thailand is not taken as seriously as it is in the United States, and it isn’t perceived as an art form. So, rather than going to school in Thailand, he decided to attend college in the United States because of the extensive development theatre has undergone in this country. Eventually he wants to go back to Thailand to help improve the perception of theatre there. “I come from a place where it’s really conservative and strict. Coming away from that norm was difficult, but here you can collaborate with other people and open yourself up to other opportunities,” he said. Rakkulchon’s set design career started at Ithaca College when he chose the theatrical production arts major. During his time as an IC student, Rakkulchon took advantage of the many set design opportunities offered in the college’s theatre and opera productions. In his work on Little Women, Rakkulchon said his design of the scrim—a theatre backdrop that appears opaque when the lighting is on a scene in front of it and transparent when the lighting is on a scene behind it—was his abstraction of a poem in the preface of the book. “While reading the novel, you definitely get the notion that Louisa May Alcott was writing about herself, therefore about her memory. What Mark Adamo, the composer, did so wonderfully in the production was to create that ambiance of sound that feels like a memory,” he said. The hardest part about designing the set, Rakkulchon said, was making sure it was secure while still keeping the design light and airy. For example, the stairs looked as if they were floating on air, but they still had to hold a large cast. “[The light and airy design] served the essence of the opera very well, for it is a memory, as memories are faded and skeletal,” Rakkulchon said. During his time at IC, Rakkulchon worked with the Williamstown Theatre Festival as a properties intern his sophomore year and as a scenic design intern in his junior year. He also participated in IC’s London Center program, studying art history and visiting art museums such as the Victoria and Albert Museum. Since his graduation in May 2015, Rakkulchon has been quite busy. He worked on two shows at the New York International Fringe Festival. 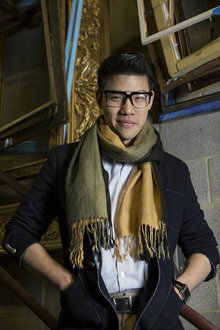 Most recently he is assisting NYC set designer Wilson Chin, working on a new musical called This Life as the set and costume designer, and serving as Broadway designer Walt Spangler’s apprentice. During the fall 2015 semester he was also an adjunct lecturer at the New York City College of Technology. Rakkulchon will also start working toward his master's degree in scenic design at the Yale School of Drama in fall 2016. “I find it hard to say no to a lot of jobs that I get because I feel like every single opportunity will be a wonderful one,” he said.